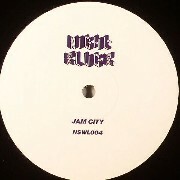 Night Slugs announce the latest installment in their white label series - the much-anticipated debut 12" of London producer Jam City. On the A side, the psychedelic grime interplorer "Ecstasy Refix" glows with warmth at its analog core. A jubilant tribute to the art of the grime refix, the track simultaneously recalls two disparate by-gone eras, to devastating effect. On the B side, Night Slugs favourite "Let Me Bang Refix" drowns a gutter house classic in sheer beams of searing fluorescent synth. Jam City borrows a vintage Wiley meme on closing track "Shut The Lights Off (Devil Mix)", all but void of a drum kit it hangs in suspension, awash in sublime synths. This EP is available only on limited vinyl.